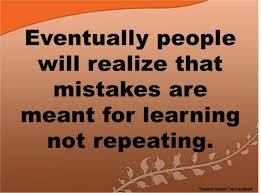 Like everyone, I’ve made lots of mistakes in my life. It’s just in our human nature to make them. Whether it is a bad decision, incorrect assumption made, poor judgment or lack thereof, such opportunities for making a wrong turn or running a red light are boundless. They will continue to surface through your lifetime and it is up to you identify them, learn from them and do your best not to repeat them. So it’s not all bad news to make mistakes as long as they make you smarter and wiser. All successful businessmen and women will tell you that they wouldn’t be where they are at in life or in their career if they didn’t at some point make a mistake that cost them. Nobody is perfect, so don’t worry yourself too much about the little things. It’s ambitious to want to be a perfectionist, but sometimes that can backfire on you if it causes you to become less efficient.